New Pulp Author Barry Reese, noted New Pulp author, brings yet another creation to life! THE ADVENTURES OF LAZARUS GRAY VOLUME ONE is Reese's entry into Pro Se's The Sovereign City Project, showcasing a hero whose own life is a mystery to himself.is now available as a top quality audiobook produced by Radio Archives! On the road to discovering his own secrets Gray and his Assistance Unlimited team encounter weirdness, madness, and over the top badness on every page! Come along for the ride for this new Barry Reese adventure, for the first entry in The Sovereign City Project and the first Pro Se Book under its new imprint, REESE UNLIMITED! Thrill to THE ADVENTURES OF LAZARUS GRAY! This pulse pounding first volume of Lazarus Gray is also available on Audible and Itunes. 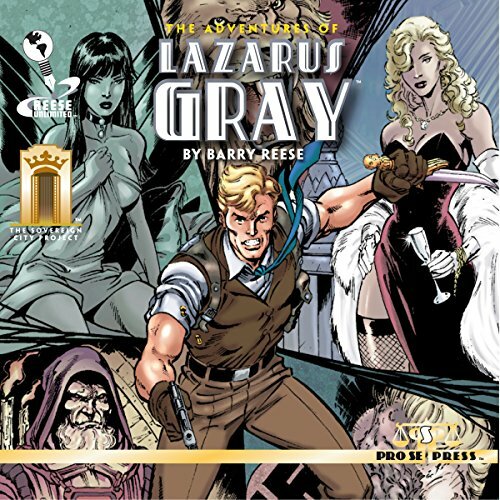 THE ADVENTURES OF LAZARUS GRAY VOLUME ONE is available in print and digital formats at Amazon and www.prose-press.com.